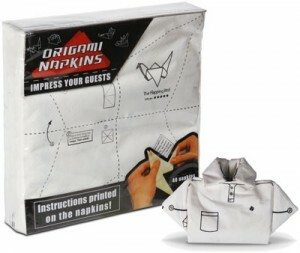 Origami Napkins have four different designs, each with their own skill level. The instructions and folding lines are printed right on the napkin itself, so you won’t have to remember a thing. You’ll learn how to make The Flapping Bird, The Polo Shirt, The Bird of Paradise, and The Jester Boot.